Automatic, or robotic, lawnmowers, sound like the things of science fiction. I mean, how could a lawnmower really do everything on auto-pilot? It's reality, however. Just look at the Roomba, that adorable automatic dust buster! Why can't there be a Roomba for your lawn? These battery-powered automatic lawnmowers are pretty quiet, even usable at night, with most of them only making as much noise as a standard window-mounted air conditioning unit. You can deploy these bad boys anytime you want, allowing them to run on a schedule. Indeed, the manufacturers actually advise that you set them to mow your lawn a couple times a week-so that they can trim small amounts at a time, keeping the clippings fine enough to be sifted back onto the yard. There is some work involved to set up your automatic lawnmower- you'll have to string a low-voltage wire along your lawn's perimeter to create an invisible fence. But after that, you are free to unleash your automatic lawnmower on your lawn, just ensuring that you plug them into their charging base to keep them fresh. In general, whenever they encounter a impediment like the bicycle your kid accidentally 'forgot' in your backyard it will, very much like a automatic pool cleaner, turnaround, head in a different direction, and when it gets tired return to its home base to recharge automatically. Let's take a look at 5 of the best-selling options on the market today. The Robomow is our top pick. It is a 61 pound automatic lawnmower that comes equipped with a rain sensor, a child lock, an ability to mow lawn areas with slopes up to 36%, and can even be programmed for multiple zones to handle each one individually. While not cheap, it has received solid feedback from its users who like its quiet operation, ability to navigate narrow passages, even and neat cutting, and consistent battery power of around 50+ minutes of operation. One user who has upwards of 6000 ft.² of lawn to deal with was initially pretty skeptical, but writes that after you set up separate zones, his robotic lawnmower was up to 99% accurate, as long as the correct square footage was input for each zone. Another user writes that it took him about five hours to get the perimeter wiring set up and his automatic mower configured correctly. Overall, this is a quality machine, who is solid user feedback albeit pretty expensive. Automatic lawnmowers frequently are pretty easy to use right out of the box. They feature artificial intelligence technology, enabling them to take on intricate lawn care responsibilities even in narrow or complex terrain areas. Shock sensor systems are included to avoid obstacles and mow around them. They also feature an ability to automatically return to charging station after done mowing or when power is low, provide customized automated lawn mowing schedules, lawn cutting heights, as well as adapting to yard sizes, slopes. Typically they will be powered by lithium ion batteries. Users say that some of the general advantages of these Roomba mowers are the appearance of a freshly mowed and hydrated lawn everyday, environmentally friendly, the ability to climb moderately steep inclines, pretty simple to change out the blades, programming interface is generally easy-to-understand, some models include security features like pin number operation, ultra quiet during operation. Landroid Users write that getting the automatic lawnmower set up was a full afternoon's work for a lawn that was about a quarter acre in size. Users claim that the instructions are pretty good but you need to be fairly thorough when wiring your yard prior to running your automatic lawnmower for the first time. Since the low-voltage wire you were stringing up around your yard is what the robotic lawnmower uses as a guide, it's important to place it pretty close to the edge of the grass. One user describes that when he had his lawn aerated the wiring was destroyed- so he advises all fellow automatic lawn mower owners to flag the wire so that it isn't destroyed during lawn aeration. The Landroid will shave off a little bit of lawn each time and one user who really spent a lot of time configuring his automatic lawnmower writes that every two months or so he'll take a pass at his lawn with his traditional lawnmower to do some edging where the Landroid wasn't able to navigate. He also says it only took half an hour to set up the schedule on his automatic lawnmower- so that wasn't too difficult. One other word of advice that he had was that he discovered it's a good idea to keep small toys and sticks off the yard because if the mower can climb over them, because they are so small, it will destroy them. One feature that he feels is missing is the ability to control his automatic lawnmower from his smartphone. During winter, he'll store the automatic lawn mower away but keep his charging station and all of the perimeter wiring in place. LawnBott LB1500 buyers had more of a negative appraisal of this particular automatic lawnmower. While it is an extremely quiet unit that can deal with on even land terrain pretty well, users found that laying the perimeter wire was really a hassle, as well as didn't expect that they would sometimes have to prepare the perimeter wire and deal with drop off areas where the automatic lawn mowers sensors just didn't work. This resulted in the lawn mower plowing directly into ditches and holes. As well, users have complained about the poor quality of this particular automatic lawnmowers design, saying that the sprockets were cheaply glued to drive spokes, the belt breaks too easily. Robomow users are pretty happy with their automatic lawnmower, although one user writes that it would be better value if it were only half its cost. Duh! They say that it is a fairly quiet automatic lawnmower, that it doesn't leave clumps of lawn and grass on the yard, that it is especially convenient on really hot days when the mosquitoes insects are out in droves, and that the routine lawn clipping keeps the lawn looking pretty attractive. That said, the iPhone app has received some complaints, and for users that live in higher crime areas they wish that there was a way to enhance the security features perhaps to GPS location services. As well, there have been some difficulties getting it to navigate more narrow areas of the yard and the battery life at around 45 minutes is generally okay but could be longer for larger lawn areas. 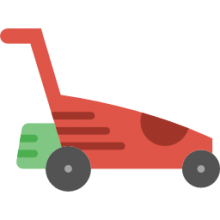 If you are sick to death of mowing your lawn in 95° heat, swarmed by mosquitoes, busting your behind pushing around a smelly, hot-metal piece of industrial equipment, perhaps an automatic lawnmower could be a good purchase for you. As we have seen, there are some initial set up headaches to string the wire around the perimeter of your property, but with some ingenuity and persistence it is doubtless you'll be able to get your lawnmower set up the way you want it. Some of the automatic lawnmowers come with Wi-Fi capability and smartphone apps allowing you to manage your lawncare remotely, perhaps from the air-conditioned convenience of your living room. All that said, we'd be lying if we didn't say that automatic lawncare is really in its infancy and these products do have some operational hiccups. Regardless, read our reviews on this page and keep checking in on automatic lawnmowers every so often to see how the new models are developing.